Marvel studios is expanding the Marvel Cinematic Universe and bringing fans to the cosmos in the action packed space adventure - Guardians of the Galaxy. A Group of two thugs, an outlaw, an assassin and a maniac will team up to battle evil and save the galaxy! 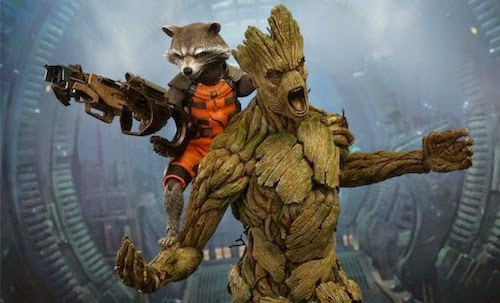 Sideshow Collectibles and Hot Toys are excited to present the special Rocket and Groot Sixth Scale Figure Set which includes the gun-toting raccoon and his personal houseplant/muscle. The movie-accurate Rocket Collectible Figure is specially crafted based on his unique physique in the film. It features a finely sculpted head and body, specially tailored costume, weapon, and specially designed figure stand. The movie-accurate Groot Collectible Figure features a highly detailed head and body with amazing paint application to reflect his distinctive appearance, and a specially designed figure stand. The Rocket and Groot Collectible Set will exclusively include an additional interchangeable angry expression face and a pair of partially clenched angry palms for Groot. You can pre-order Rocket and Groot from Sideshow Collectibles for delivery in March 2015. An Avengers movie every 3 years?